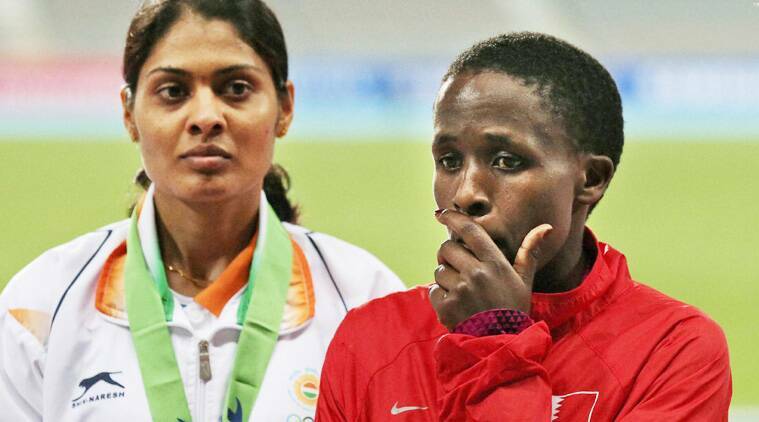 Babar and Sudha were upgraded from bronze and 4th-place finish after Ruth Jebet was stripped of victory. 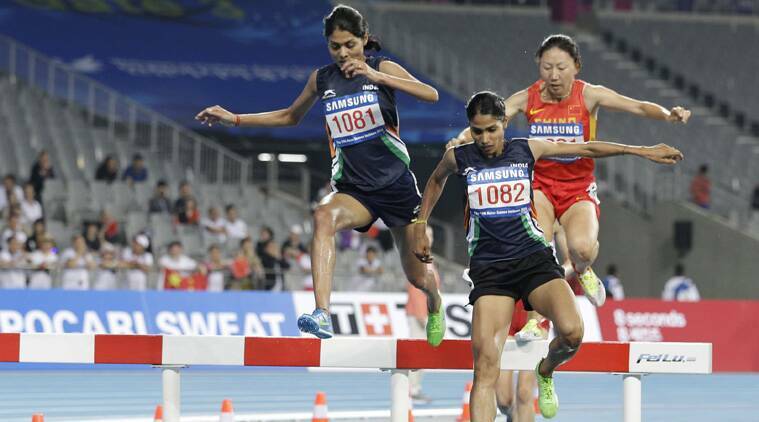 Lalita Babar and Sudha Singh clinched a silver and a bronze under dramatic circumstances in women’s 3000m steeplechase after a Bahraini runner was disqualified as India opened their medal account on the opening day of athletics competition at the Asian Games on Saturday. Babar and defending champion Sudha were upgraded from bronze and fourth-place finish after Bahrain’s Ruth Jebet was sensationally stripped of victory after comfortably winning the race in what could have been a Games record time. The teenager, who switched nationality from her native Kenya last year, was disqualified for stepping inside the track on her second last lap after stumbling while well clear of the rest of the field and under no pressure. It was learnt that India lodged a protest that Jebet should be disqualified. The announcement of her disqualification was made over the Incheon Asiad Main Stadium public address system as the 17-year-old was about to step onto the podium to receive her gold and the reigning world junior champion was led away in floods of tears. Incidentally, this was the second time Jebet was stripped of a gold in a top competition in little more than a year as she had also won the 2013 Asian Championships title in Pune only to be ruled by the IAAF, the world governing body of the sport, that she was not eligible to run for Bahrain at that time. Sudha, who finished second in that event, was declared gold winner later on. To the credit of the Indians, both Babar and Sudha ran their personal best times of 9:35.37 and 9:35.64 respectively. Lalita and Sudha appeared headed to finish behind only pre-race gold medal favourite Jebet but China’s Li Zhenzhu (9:35.23), who later won the gold after the Bahraini’s disqualification, overtook them from nowhere on the final straight. While Lalita, who hails from Satara in Maharashtra, dipped well under her previous best of 9:52.34 clocked at Federation Cup at Patiala last month when crossing the line in 9:35.37, her Mumbai-based Central Railway teammate Sudha too clocked her career-best time of 9:35.64, her earliest best being 9:45.60, clocked last year. India, however, faced reversals for the major part though two men’s 400m runners made it to the finals via the heats and semifinals. Preeja Sreedharan, the defending champion in women’s 10000m finished a disappointing seventh in the final despite clocking her season best time of 32:29.17. In fact, the time set by gold medallist Alia Mohammed of United Arab Emirates – 31:51.86 – was slower than what Preeja had done four years ago – 31:50.47. Her best time of the season coming into the Games was 34:27.94. The silver medal went to Changquin Ding of China (31:53.09) and the bronze was grabbed by Asian season leader Ayumi Hagiwara of Japan in 31:55.67. The men’s hammer throw and 5000m finals, as well as the women’s 100m heats, saw Indians failing to make a mark. In men’s hammer final, N Chandrodaya Singh fouled three of his six attempts and came up with his best try of 66.98m which was well below his season’s best of 69.38m. Dilshad Nazarov of Tajikistan won the gold by hurling the iron ball and chain to 76.82m while Wang Shizu and Wan Yong of China grabbed the silver and bronze with season’s best efforts of 73.65 and 73.43 respectively. In the 5000m final, the Indian duo of Kheta Ram and Suresh Kumar clocked personal best times, but the intensity of the competition meant that they had to be content with seventh and ninth places respectively in 13:37.40 and 13:42.28, significant improvements on their career-best times of 13:49.17 and 13:52.58 which they had clocked at Patiala last month. The race was won by Al Garni Mohamad of Qatar in a new Games record of 13:26.13. Bahrain’s Alemu Bekele Gebre and Albert Kibichii Rop got the silver and bronze clocking 13:27.98 and 13:28.08 respectively. Though these two distance runners should be credited for clocking their best and yet not climbing the medal podium, women’s 100m runner Sharada Narayanan performed poorly in the heats and crashed out. She came in fifth in her first round heat in a modest 12.04 seconds. As the day’s events drew to a close, there was some cheer when Kunhu Mohammed and Arokia Rajiv both made it to the finals of the men’s 400m through first round heats and semifinals. While Arokia qualified directly after finishing third in the second semifinal in 46.22, Mohammed ended up fourth in the first semifinal after clocking a personal best of 46.08 and then qualified as one of the two fastest timers from remaining runners. The final is scheduled on Sunday.